One of the sessions at newsrewired – connected journalism will be looking in detail at integrated storytelling, and the array of tools, platforms and techniques available to journalists to pull in content from across the web. In this post we have collected just five examples of curation tools which can help journalists to integrate their multimedia reporting. Pulling this list together it is hard to believe that all of these five storytelling tools are less than 18 months old. 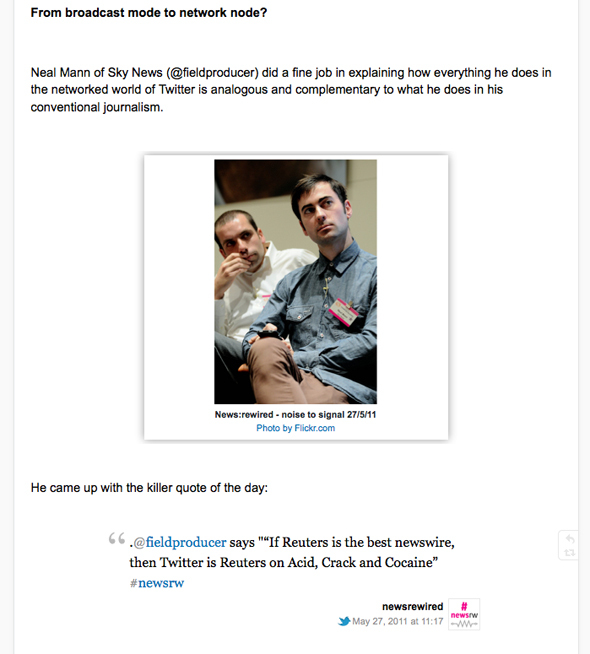 In fact just four months ago Storify (whose co-founder Xavier Damman will be speaking at news:rewired – connected journalism) was in private beta; now it’s a verb heard in newsrooms around the world. 1. Storify allows journalists to curate social media posts including tweets, Flickr photos and YouTube videos. The best examples are those that include narrative. For example, Mark Jones from Reuters put together this excellent Storify to explain what went on at the last news:rewired event. What makes this such an effective example is the use of text boxes for explanations between the curated tweets and photos. 2. Storyful is similar to Storify in the way it allows journalists to pull tweets, videos and photos from around the web. Here is a very powerful example from yesterday: a Storyful reporting on foreign journalists trapped in the Rixos hotel in Tripoli. 3. Bundlr is another similar tool but presents stories in a slightly different, more uniform way. Here’s an example from Wannabe Hack Nick Petrie telling the story of the Birmingham riots. 4. Chirpstory is similar to the above three tools but focuses on tweets. You can build a story based on tweets, adding narrative between the tweets and highlight tweets of particular interest. Here’s a Chirpstory from Journalism.co.uk on advice for those about to start journalism courses at university. 5. Pearltrees is the odd one out on this list. It allows you to curate and share tweets, web pages, YouTube videos and photos but in a different format: you build links between your “pearls” of content to create the tree. 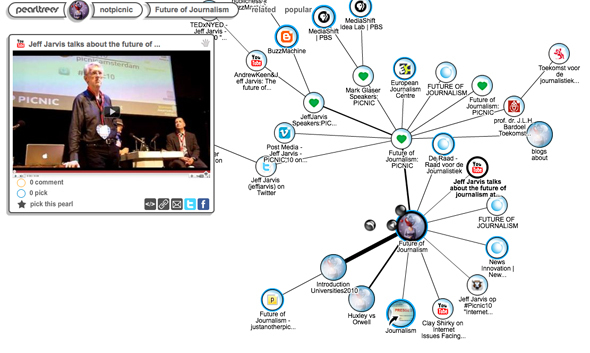 Here’s an example of a Pearltree on the future of journalism. You can find out more about the integrated storytelling session at news:rewired – connected journalism and the full event agenda is here. You can buy tickets here.